The STEELHOUSE™ Door will have an immediate impact on the curb appeal of any home. The design of the STEELHOUSE™ Door brings the traditional look and design of the old style wood carriage door without the problems that were once associated with the older wood door. At half the cost, half the weight, and with a maintenance free exterior, you cannot make a better investment in your home’s exterior appearance. SteeLite® is an alternative design for the price conscience consumer who understands a garage door’s impact on the curb appeal of their home. A unique design that are sure to delight the most discriminating homeowner. Optional designer window treatments and decorative hardware are also available. The Woodie Plank™ Series garage doors are the ultimate in classic craftsmanship combined with modern engineering. From old style carriage house to contemporary styling, the doors are manufactured to your standards and specifications. The doors can be further enhanced with a variety of classically finished decorative hardware and window designs. A Woodie Plank™ Series garage door can be an important design element, complimenting and enhancing your home’s appeal and value. The Universal Model 325 is built using only the finest materials. Formed with unique bead board raised panel, the Model 325 is embossed with a natural wood grain texture raised panel with recessed vertical embossments and a baked-on polyester finish. The Model 325 will give your home the appearance of having custom wood carriage house doors with the durability and longevity of steel. Rawhide Series garage doors are built for strength and longevity. The Rawhide Series offers 24 gauge steel without sacrificing beauty. The exterior of the door is embossed with a woodgrain texture finish accented by the elegant raised panel design. 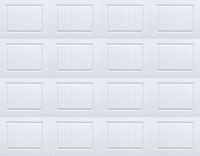 These are cost effective garage doors produced with exceptional quality, using only the finest materials. Quality constructed 25 gauge, 2-inch thick uninsulated steel sectional garage door for the economically minded customer. Simply stated, no other door manufacturer builds a higher quality low cost steel door with the features of 1st United Door Technologies.